2011 has been a good year for us. Its a year a friendships for me & my circle of friends in the office - whom I called SUPER FRIENDS. And since others just came from vacation we're not able to welcome 2012 together. "PAGSALUBONG 2012" as we called our New Year's Party held a bit late as we celebrate it January 27, 2012 but anyhow the spirit of welcoming is still the same. After conversations thru emails, a simple cravings turned into a celebration. Simple plan turned into a special Friday being together. Being with each others company is a day of laughter and joy. No dull moments being together. "Siksik, liglig, at umaapaw" ang blessings - busog na busog na may take away pa! In any gatherings, what matters are the people who are with you in celebrating, the moments with them are the one to be treasured and soon to be memories. Thanks to SUPER FRIENDS for making all of our gathering special that really wothy to be treasured. 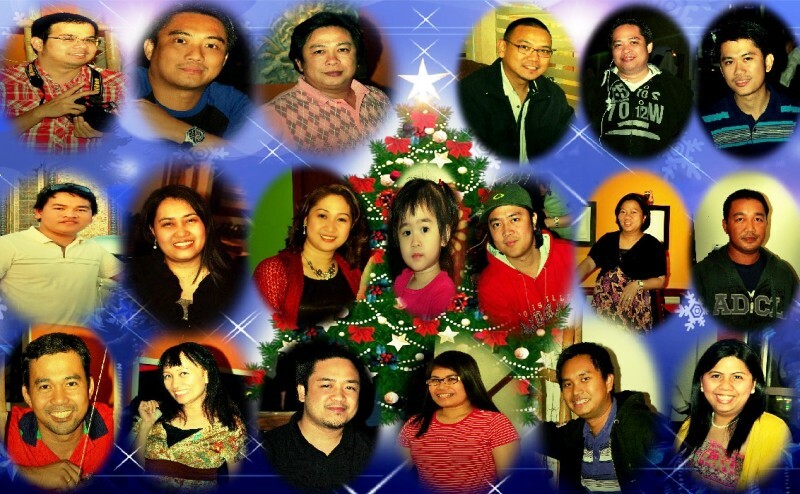 Looking for more occasions, gatherings, and simply bonding moments this 2012. "Siksik, liglig, umaapaw" 2012 for all of us! I always have a camera with me everyday. I want every important moment to be captured, as one of my friend told me, I want every event to be documented. Its not matter how special or how ordinary it is, I just want have something with me when time comes that I want to reminisce those days - picture will be the clear view of every story. I always expected that since I have with me with Cassey, I will not be in the scene - in short I will be the one who will take the picture unless someone volunteer to do so (once in a blue moon..hahaha). As my circle of friends told me once when I am absent to our gatherings they only have little pictures because no one will take them picture as eager as I am - documented celebrations as they called. But last January 12, 2012 during our company party, I enjoyed being the one on the scene instead the one who captured the moments. Thanks SOJV Digital Photographers (SDP) - thanks Tamz, Josh, Meg, Rai and specially to Rick that most of the shots taken included me..hahaha. Pictures always speaks - tells story, reveals something, so if next time someone approach you if he can take shots on you, don't hesitate to - few years from that time you'll just smile and say to yourself "this is how i look noon.." and surely you'll start reminiscing. Why you will settle for someone that you are just next in line and sometimes least in his priorities when you can have someone who can make you his priority. Don't fool yourself that in the long run he can learn to love you the way you want him to love you, don't waste your time in spending with the person who can't fight for you...maybe while you are busy for nothing the person who really love you will get tired and leave you as well. Love yourself! "Halos sa hospital na tayo tumira nung bata ka" that's the usual story that my mom told me or to any other person kung sakit din lang ang paguusapan. According to her, its a good thing as well that their house (her parents' house) is located very close to the hospital so if they need extra assistance for me they can immediately asks for help. My both parents worked as health personnel in DOH (Department of Health), one reasons maybe why they are very cautious when it comes to sickness. "Masakitin ako" I admit. One reasons why I never had a chance to expose to some sport activities, there were times that when my classmates are playing sporty games I'm just sitting down to be the scorer, bawal daw kasi akong mapagod. My Dad even went to the school to talk to my teacher and ask permission for my "yaya" na ihatid ako until to my seat, kasi naman nasa 4th floor yung room ko and I'm carrying a trolley style bag with more or less 10 books + notebooks. I was in grade 4 that time. Little by little I was exposed to the environment, according to the doctor kelangan daw maexpose din sa environment, masama din naman kasi daw yung di naeexpose sa germs kasi humihina ang immune system lalo, so I was allowed then to play some outside sports - i love "patintero". I saw how Mommy & Daddy worries when I am sick or even when my little brother is sicked. The hardest point is when they still need to be in the office even when I am sick and nobody will be beside me. Kahit nung college days ko na or even I was already working na, pag maiiwan ako sa bahay ng may sakit, everything is ready and prepared already - my food and medicines at lahat nang possible needs ko nasa side table na beside my bed and she will check me from time to time to remind me to eat and to take my medicines. There were times I heard them saying "na mas mabuti pa na sila na lang ang may sakit kesa kami" When I asked them if its ok for them for me to worked abroad, one of their worries is my health condition, I was anemic that time, my blood pressure sometimes down to 70 over 70 or you can see my nails looks like wearing a violet nail polish and my lips are colored with pale peach lipstick. And thanks be to God, I was healed. Being away with family and loved ones makes me sicker when I am sick. Even I am away and sicked my mom never forgot to remind me to take my medicines and which medicines I need to take. I will fiirst consult her before taking any, she knows what's the best in me! she's my personal nurse ever since. She knows my medical history more than any doctors or other nurses do. I am thankful of having my personal nurses that even I am a million miles away with them, they can still show and feel how much they care and love me. Thank you Lord for their lives. "Ang blessings parang ilog yan kailangan na nagfloflow hindi dapat stagnant kasi kung ganon mabubulok ang tubig, if you have something then share it and surely more blessings you will receive"
Its been two weeks after we had the donation's drive for the victim of the typhoon Sendong and just last Friday I was able to send it - the monetary & in kind donations. I am thankful and blessed that the Lord used me once more as a channel of His blessings; that He used me once more to lead the donation's drive. Although I was busy it didn't hinder me to make the best I can in order to move and help those victims in my little way. Honestly, there were times that I felt guilty for doing my holiday shopping & other activities instead of collecting those envelopes I distributed and packing the in kind donations I gathered. But after the holidays I made up my mind and set my heart that I need to move again. Immediately after the Christmas holiday, I got so many responses from my friends, colleagues and Church-mates. My prayer to collect all the donations within 2-3 days was answered, more than all things become so easy for me even I am busy at work. I talked and coordinated to some persons until I finally settled everything. First day of 2012, all the monetary donations were counted, thanks Darwin Molina - a friend of mine who helped me and to Delson Villanueva, a former colleague and a good friend of mine who helped in making my decision to whom (agency) to send the money. The Lord answered my prayer and He gave me to send the monetary donations directly to Department of Social Welfare & Development (DSWD) - Region 10. It took me several days to send the money, I've waited few days for them to answer on email, I coordinated with friends in the Philippines who are also working in the government agency, thanks Luzelmarly Dapula a.k.a Tita Chie for your effort to contact DSWD 10. Thank you for all the cheerful givers who shared their money - sharing your treasure is blessing them in a way. "babalik ng siksik, liglig at umaapaw lahat ng yan sa inyo"
We just finished our OWWA gift giving last December 2011 and I'm just thinking if I can still collect something like used clothes, shoes or any thing to be send to the victims of the typhoon. And I really praise God immediately after I send the email and poster I made for the donation drive there are some people who responded and confirmed that they will give something. Thank you to my friend & colleague Rhea Manzanilla-Gonzales for being the first to respond. Likewise thank you to Marilen Roxas, Biler family, our BS head Kuya Ver, Mark Quintana for being the contact person in collecting donations to SOJV camp. Thank you to Delson Villanueva together with the SFC service team who packed all the in kind donations. 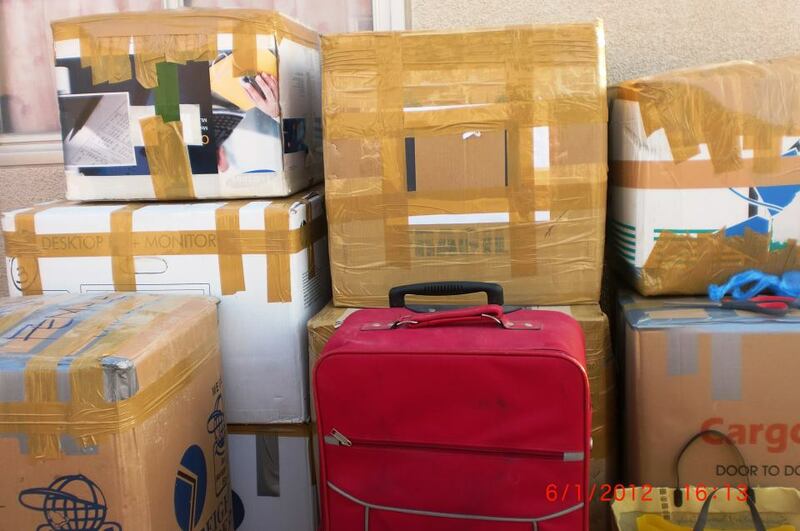 The next day SFC service team delivered it to Philippine Embassy. 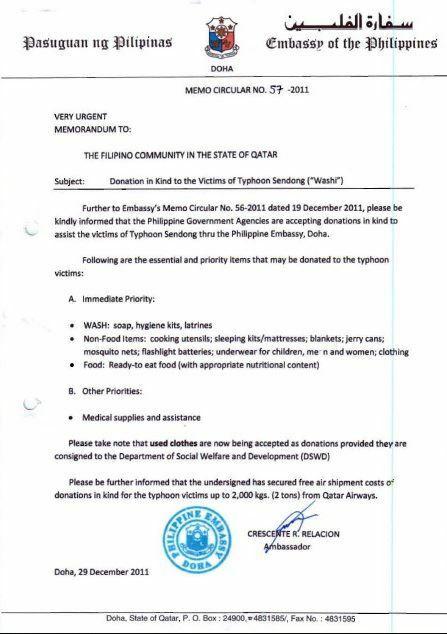 Likewise, thank you so much Qatar Airways for letting those in kind donations be send free to our kababayans in the Philippines. 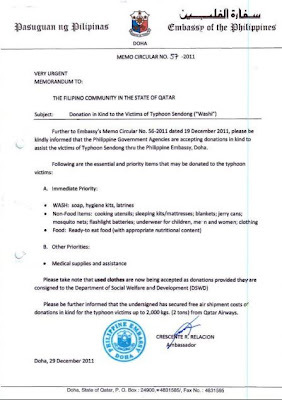 For those who still want to share your blessings and extend help to our kababayans, you still have time to bring those packed in kind donations at Philippine Embassy Doha Qatar until January 15, 2012. 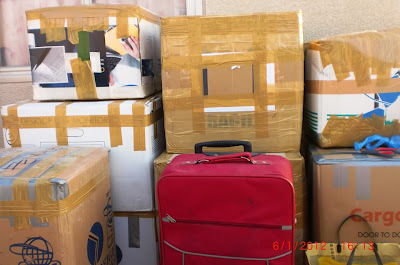 Be sure that its already packed and ready to send. Sharing our blessings to others especially to those who are need is blessing not only the recipient but also ourselves. It only means we are blessed because we can share and give. Once more, its not how much you give but its the LOVE you put in giving. Thank you to all cheerful givers! TOGETHER WE CAN MAKE IT! 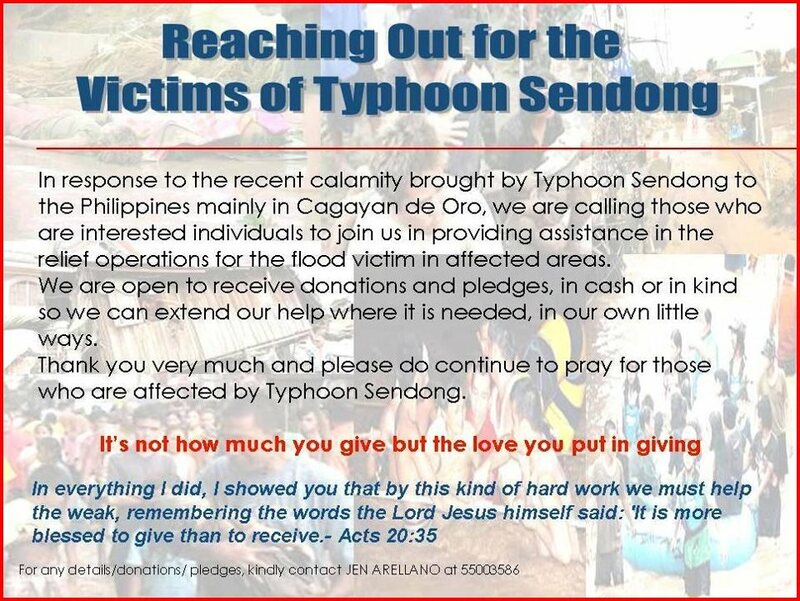 Let us continue to reach out people with our love. This week I heard a lots of complaints, murmuring over small things and sightings opinions to convince others to the stand the same. It's tough for me to stand different from what they believed for - its like me against the world scenario..hahaha. The company I've been working always hold a party every year but last year they didn't have one due to some reasons. People are keep on asking and some our complaining why there's no party. After few days they issued a memorandum they will going to hold it early this year. And today is the day. I've been working in the company for more than 5 years and I attended all the parties they organized from the first day I've been hired. I don't think I have any reasons not to grant their invitations. For me holding a company party is one way for the company to reach out people no matter how boring it looks like. Enjoying the night anyways is depends on the person - if you choose to spoil the night its up to you. It's sad to hear that people are keep on complaining - commenting on something they don't know yet what awaits for them. "Nung walang party last December nagcocomplain ngayong nagorganize ng party nagcocomplain pa rin" people are really hard to please but I guess its in the attitude of being ungrateful. No organization is perfect - people will always find faults no matter how good or not that good the company is. I have some complaints, comments and sentiments toward the company as well but as I always believed I'd rather it be mine than to influence people in such a negative manner. "Wag na kasing magcomment ng kung ano-ano just to try to influence other na magsalita rin ng negative" Words are powerful - what you say can influence people and what you say will turn back on you. Instead of complaining why don't you be grateful - this is the time for you to reach out for your other colleagues, iba pa rin ang bonding 'pag nasa labas ng office, sino ang magpapakain sa'yo basta basta sa isang hotel ng libre? its your chance as well to be out of the office early and dressed up the way you want....ang daming reasons to be grateful but if you still don't find those reasons to be thankful sana lang don't say anything na you're trying to influence others na hindi nila maeenjoy yung party. Anyways, enjoying any moments depends on the person - it comes from within! if you want to enjoy you must set your mind and heart that you'll enjoy the night. Its just a matter of right thinking. Lastly, its not the organizers who'll loose if you'll not attending - its you because you'll gonna miss the moments - moments that will not happen again. Be grateful on all things & circumstance! Enjoy & keep memories ^_^ - it once in a while & no one knows if there will be next time. "new growth happens only if there are empty spaces in your life"
I though people I've been mingle are all tired of asking me when I will be getting married, as most of the time they asked me the same question over and over. But before the 2011 ends most them are wishing and hoping that on this year 2012 they will hear a wedding bells from me. I usually smiled as I am used to them and those wishes (every year). I know they only want me to be happy happier. But as I always said I will not enter into relationships just to say that I have someone with me. Pwede kayang magpainterview na lang on national television or magpapublish on top publications just to announce "YES, I AM STILL SINGLE" so people will stop asking me "single ka pa?" or "kelan ka magaasawa?" But as I've said I'm used to them but there were times na nakakainis na rin. 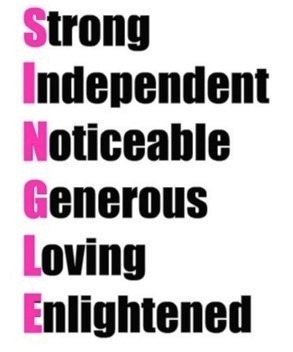 Maybe people are thinking that if one is single - she's not happy, she's not fulfilled, there's bitterness on her, she's boring and doesn't enjoys life. For those who are thinking that I am that kind of woman, sorry to disappoint you. Here are some of the advise I got from Mr. Rick Warren's book; hopefully it can help you as you walk into singleness. DON'T DATE BECAUSE YOUR DESPERATE. DON'T SLEEP AROUND BECAUSE YOU THINK YOU ARE OLD AND KNOW BETTER. NO ONE COMPLETES YOU - EXCEPT YOU! DON'T GROW OLD - JUST GROW YOU! To those people who are keep on asking me when I will be getting married, I will announce it for sure and you'll be invited and just want to say thank you as well for making me subject of your concern every time you're asking when I am getting married ^_^. Don't get married for wrong reasons. Remember that you'll not the only one who will suffer if you do it for wrong reasons - both of you who are in the covenant of marriage as well as your future children. It's been a tradition within "super friends" (my circle of friends in the office) to treat the birthday celebrant with a lunch on his birthday, it is supposedly a surprise but since we're doing it for some years, hindi na sya nagiging surprise for the celebrant. We started the first week of 2012 on celebrating the birthdays of the "SUPER DAD", Kuya Noel anad the "MOM TO BE", Dolor. A simple lunch yet become special because of the presence of all (except those who are in vacation). Noel Mendoza a.k.a Kuya Noel for everyone of us. Why "SUPER DAD"? 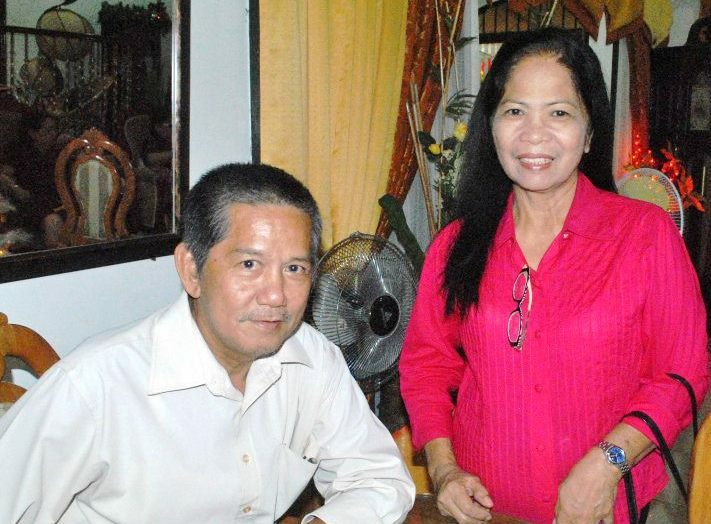 He is a single father to a young lady who will be graduating college this coming March 2012. For 5 years that we are together in the company I saw how he cares & love his daughter a lot and even he is working here in abroad, he never let her daughter feel that she has no parents by her side. I remembered when her daughter celebrated her 18th birthday despite that Kuya is working away he make it a point that he can still participate from preparation until its celebration. He asked our help from party favor to multi media presentation up to her daughter pre-debut pictorial is still subject to his approval. We always teased him that he is a strict father, and he will always reply that there is always right time for everything. Two thumbs up for you for being a responsible & loving father. Once more Kuya, Happy happy Birthday! I am personally wishing you good health and strength in all aspects of your life. Looking forward for more good years together! She's one of the first that I have since I started in the company. I've been friend to her from the start and now we're been running on our sixth years. Dolores Juan - Ildefonso a.k.a Dolor for us, the queen of "vault" every 25th of the month. She's the only child in the family, one of the reason why she and her husband always wanted to have a child after they got married. After years of waiting, their prayer was answered and now she is about to give birth to a baby boy this month. I know both of you will be a responsible parents to "bebe" and a good provider as well. We are all excited to welcome "bebe", another angel of the SUPER FRIENDS. Happy happy Birthday Dolor! Wishing you safe delivery and claimed that "bebe" as I've said a helathy & wealthy baby. Cheers to more years of friendships! Celebrating the birth of each other is important to us, its one way for us to thank the Lord for giving us each other - it may be simple but the thought of the celebration will always be special. "Mahirap kapag nakalimutan ang mga bagay na dapat tandaan, pero mas mahirap kapag di makalimutan ang mga bagay na matagal na dapat kinalimutan"
Being with the people that matters in your life is the best to end and to start the year. Unlike in Philippines and some other countries, the last day of the year is a non working holiday but here in the Middle East is different, it depends upon the discretion of the company. And since we're one of those company who are not fortunate in taking that holiday, we ended the year by having lunch together. 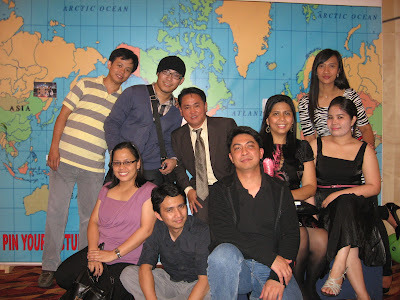 Being with my Filipinos Procurement Family is one of the best thing to end up the year in the office. While everyone is busy in preparing for the "media noche" I spent my last day of 2011 by calling my family in the Philippines and attending the New Year's eve mass in the Church. So blessed to end the year worshiping, praising and making covenant with the Lord. While other people are rushing to go home before midnight to welcome 2012, Christians who are gathered in QICM (Qatar International Christian Ministry) doesn't mind the time instead asking for more and more songs to the music team for continuous worship to the Lord. I am used to welcome the New Year with the family and even I am away to my immediate family I used to celebrate it with my relatives or friends. I used to have dinner with them, countdown until its 12 midnight and we have some parlor games to break the sleepy feelings. But last December 31, 2011 is different, not so many relatives or friends with me to celebrate and welcome the 2012. After I got home from the Church I just watched some of the friends of Evangelio family (where I am staying), eat one stick of BBQ and entered into my room and chatted with some my good friends. It may sounds boring for some but for me celebrating & welcoming new year is not just in the party moreover is sincerity to give thanks to God. Exchanging gifts with my family is one of the highlights of our New Year in the Philippines, opening gifts after family prayer or while eating "media noche" but even though I don't have my family here to exchange gifts with I am glad to received gifts on New Year's eve. Thank you Darwin & Kuya Dan for the gift. I like the print "Knowledge is Power. Attitude is Everything" but Darwin said it was given to me so I can live strong and he added that I must stays happy everyday. Thank you! Thank you Evangelio Family - Kuya Matt, Ate Liezel and Aleeza for this gift. Scented and refreshing start of the year! I don't like good byes, I think everyone does but its better to be with the person for the last time that to missed her. It's a surprise farewell party supposedly with a colleague and friend Angie but since we're only five it became a surprise visit. Well, I guess she was surprised. Reminiscing how we started being friends and asking her what's her future life's plan is our subject of "kwentuhan" What made me weak is when Angie gave me a very tight hugs - I felt the sincerity and warm of love and friendship that melt my heart. As I've told her i am sad that she will leave but at the same I am happy for her for the new life awaits her in the Philippines. Thank you for wonderful years of friendship. I will miss you so much but as I've said there's no good byes Angie just see you soon! After we visited Angie, I directly go the mall to find a dress - thanks i found one ^_^ then when I reached home I asked Darwin to help me to count all the monetary donations that we have collected for the victims of typhoon sendong. Thank you Darwin! Around 8:00 p.m. I received a call from Delson, a friend of mine who's the same person to whom I supposedly handed the donations that he will not take the donations with him that evening and instead he invited me to take a cup of coffee. 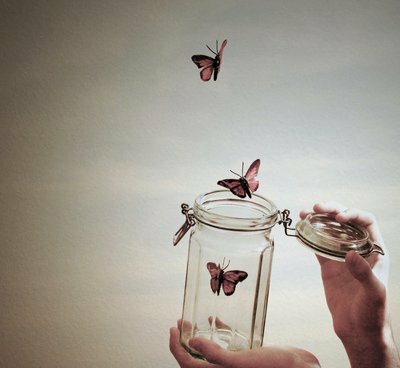 I don't remember when was the last time we shared stories about our lives, families, charity works and plans. We ended the night encouraging each other to continuously be blessed & be blessings to other people. I feel so fulfilled & blessed ended my 2011 right and started my 2012 with people I love and treasured. Have a blessed 2012! Hope you started it right as well and the way you want it to be started.